The rankings issued after the conclusion of the eleventh race have therefore become final. 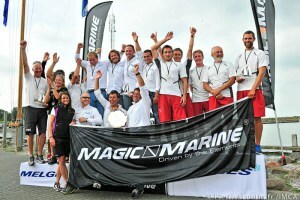 The total lack of wind made it impossible to dispute the last race of the Magic Marine Melges 24 European Championship. 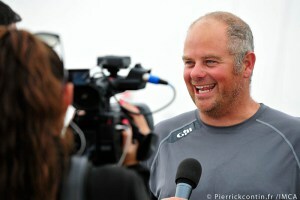 After four hours of waiting, the Principal Race Officer, Hank Stuart, was forced to send the sailors home and declare over the event organized by the Royal Yacht Club Hollandia in collaboration with the International Melges 24 Class Association. With help from a Trailer Valet boat trailer dolly, teams were able to easily launch and retrieve sailing boats quickly as weather conditions changed leading up to race time. We'd like to thank all of the race participants and other enthusiasts for joining us on a beautiful day no matter what the weather. The rankings issued after the conclusion of the eleventh race have therefore become final. In addition to Flavio Favini’s Blu Moon – Gabriele Benussi, Stefano Rizzi, Giovanni Ferrari and Nicholas Dal Ferro with him – who were already sure of success in the Open Division from last night, the Corinthian European title was claimed by the Dutch Team Kesbeke/Sika – Ronald Veraar, Eolco Blok, Bart Snel and Pim Mommersteeg – that managed to overcome the two-time Olympic medalist Tonu Toniste who, on board Estonia’s Lenny, was considered the pre-race favorite. The Corinthian podium was completed by another Estonian crew: Rock City by Tiit Vihul. Returning to the Open division, the places of honor went to the Czechs of ICZ, helmed by the two times Olympian Martin Trcka, and Riccardo Simoneschi’s Audi Ultra. Finishing third by just two points, the crew of the Audi Sailing Team Italy still has reinforced its leadership in the Melges 24 European Sailing Series, for which the Magic Marine Melges 24 European Championship was the fourth event. The International Melges 24 Class now looks forward to its next major events which are the Sperry Top-Sider Melges 24 World Championship 2013 in San Francisco from 30 September to 5 October and the 2014 Melges 24 Worlds, which will be held for the first time in the Southern Hemisphere from 23 January to 2 February 2014 at Geelong, Australia. 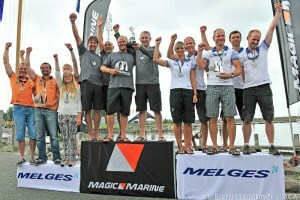 With no sailing possible because of light winds today Ronald Veraar and his crew of Eelco Blok, Bart Snel and Pim Mommersteeg are crowned Corinthian Magic Marine Melges 24 European Champions 2013. Full report to follow shortly. 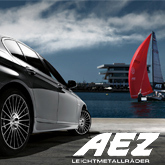 Magic Marine Melges 24 European Championship 2013. Race production footage equipment provided by 110220Volts . All footage is compatible region code free DVD players.